This really sweet Neal Adams cover appears as if it takes place only seconds after the cover for issue #137 depicting the two Flashes pummeling each other as the arch villain Vandal Savage hovers mid-air in the background. 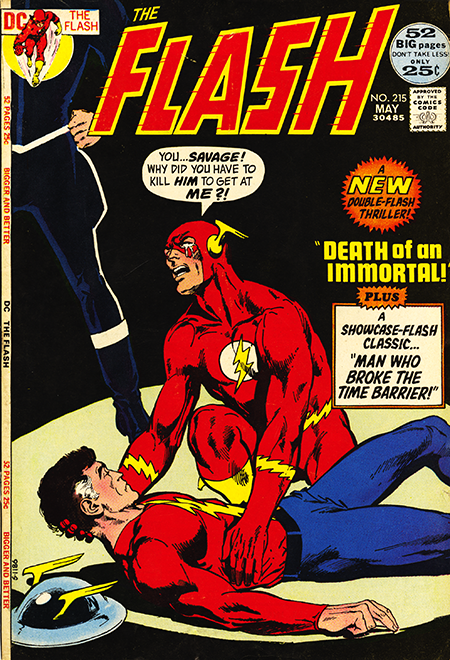 Only now Vandal Savage has come to ground just as Barry Allen appears to have killed Jay Garrick. I’d have to say that, personally (which is what I’m about here), I’d rank this as one of the top ten covers of the entire Silver Age Flash run. The fact that the story that follows so neatly picks up on and honors previous Flash continuity no doubt has to do with the fact that it’s scripted by former Flash letter hack Len Wein who has already shown his genuine respect for the work that has preceded him. The story is double the length of recent Flash tales which allows Wein some space for a couple of pages of exposition on the history of the the man known as Vandal Savage. It starts back in the Pro-Magnon period when a caveman known as Vandar Adg receives the gift of immortality from the explosion of a crashing meteor. It reveals his march through history assuming such guises as Cheops, Ghengis Khan and Napoleon. But, apparently there were still a few bugs in the system as Savage now finds that after having been around for a really long time he’s starting to age at a pretty decent clip. Then he discovers that a similar meteor to the one that immortalized him exists in the time stream in a place called limbo. So he bamboozles the two Flashes to go there and send it back into our dimension so it can explode and and bathe him (avert your eyes) in it’s Ponce de Leonian rays. Which they do, but only after they have to best Tempus, Guardian of the Time Stream in battle. It’s a pretty good story that’s only marred a little by some rather embarrassing depictions of the time stream (a green flowing pathway with stars floating all around embarrassing). All in all, though, one of the better Flash stories in the cannon. Oh, yeah, the two Flashes return just in to find the meteor arriving and, instead of exploding in the air, smashing right into Vandal Savage and leaving him a smoking hole in the ground. Ouch! Like I said, still a few bugs. What’s that? You want to know if being bathed in the exploding meteor’s rays as they watched from a safe distance caused the Flashes to become immortal just like Savage originally did? Huh, that never occurred to me… or apparently to Len Wein.